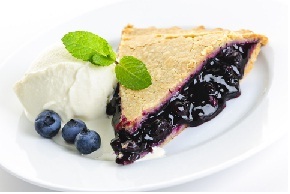 There's nothing more delicious than fresh baked blueberry pie. It has been a staple of life for many, many years. I can't think a better way to end a summer day than with a slice of warm pie and a scoop of cool vanilla ice cream. Over the years I have collected several pie recipes. Some may seem similar but, if you look closely, they have slight variations. I have also included no-bake recipes so you won't "heat up" the kitchen on hot summer days! I hope you have fun trying each one and choosing your favorite to share with friends and family. Listed below you will find everything from the basic pie recipe to some a bit more complicated but worth the effort.